Auntie’s Cottage is a welcoming homely retreat located within the picturesque mountain village of Makriotika, on the slopes of the mountain ‘Agia Dynati’, offering a quiet stay in a lovely rural setting - away from it all but easy to reach places of interest - and the opportunity for you to experience the serene greek rural life. Because of its location the cottage overlooks the valley of Pylaros and the garden terrace boasts stunning views across the beautiful valley and the sea beyond. It is ideally based for those who love nature and hiking as they will discover beautiful walking trails throughout the surrounding small villages and mountains in the valley. The beautifully well kept outside area provides a secluded setting for lazy days. Within a short walking distance (approx. 130m.) you will find Makriotika village square with a mini market, a cafe or indulge in traditional dishes at the local taverna. Supermarket, bakery and gas station can be found within approximately 1 km. The quaint village of Agia Efimia, a 5 minute drive, offers all amenities from supermarkets, bars, cafes and tavernas to atm machine, pharmacy, tourist information and car/motorbike/motorboat rental places. There are numerous beautiful pebble coves for you to enjoy your swim and scuba diving lessons can be booked. Other outdoor activities, such as horseback riding & water skiing are provided in the area. Within approx. a 7 minute drive you reach the amazing Myrtos beach famed for the beauty of its blue water (voted one of the top ten beaches in the world). 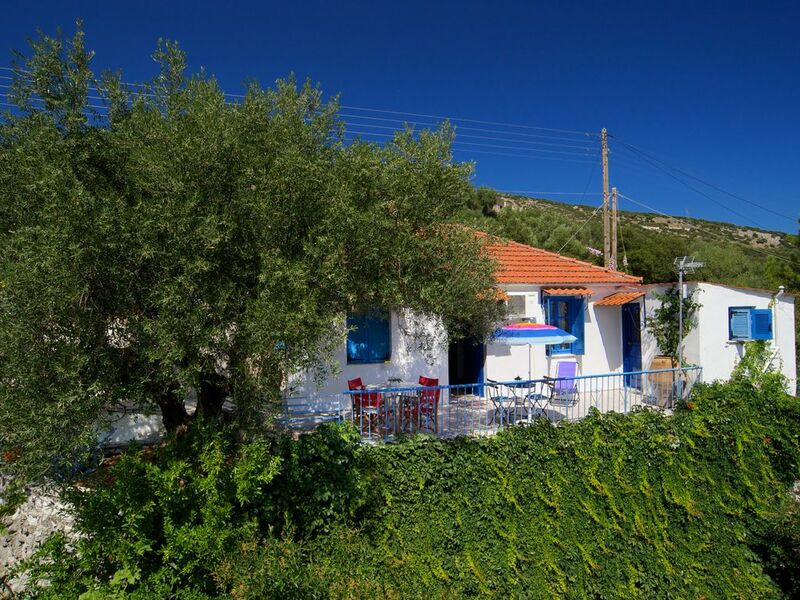 Makriotika and "Auntie’s Cottage" are an ideal base for exploring Kefalonia. The village itself is in a great central location regarding distances, giving easy access to all areas of the island, especially the northern part of the island (Agia Efimia, Sami, Assos, Fiscardo, Myrtos beach). Hello, my name is Sophia with a ph :D I was born in South Africa from Cephalonian parents and I moved to Greece at the age of 7. I'n 2016, I decided to settle in Cephalonia. Auntie's Cottage is the place where I spent almost all of my summers as a kid and was owned by my aunt, hence the name. I like every color but my favorite is purple and grey. I'm a perfectionist and an avid 80s music fan. Can't wait to host your perfect vacations in Makriotika. toilet, shower, shower, washing machine. One bathroom with shower and washing machine. All rooms of the property have individual air-condition units. All linen are provided and can be changed by the renters whenever they like, without the need of having to clean them. There is private parking space within the property land and inside a gated entrance. Free wireless internet in all areas of the property. Lounge and dining area with openings to furnished balcony offering beautiful mountain and sea view. A complimentary welcome pack will be offered on your arrival. Fully equipped kitchen with fridge/freezer, kitchen utensils, hob&oven, microwave, toaster, kettle, coffee maker and door to the front veranda and the backyard. Open to the dining and lounge area. Inside dining area open to the living room and with access to the front balcony and backyard. Outside dining area both in front balcony with beautiful views and in backyard accessed by kitchen. Furnished front balcony with stunning sea & mountain views with access from the living room and kitchen. Furnished veranda and backyard with access from the kitchen and living room, where you can enjoy your breakfast or meal. The hosts were very helpful and keen to please. The cottage is well appointed but with a Greek charm about it. Within approx. a 7 minute drive you will reach Myrtos beach, voted one of the top ten beaches in the world and within approx. 20 minute drive along the east coast you will find Antisamos beach (near the port of Sami) with stunning mountain view. In Agia Efimia, a 5 minute drive from the cottage, you can choose from numerous beautiful pebble coves to enjoy swimming and snorkeling. Motorboats are available to hire to explore some more idyllic hidden little beaches that can not be reached by car. As you drive from Agia Efimia to Sami more small white pebble coves can be found along the way, ideal for snorkeling. Kefalonia Airport (EFL) is approximately 35 km from "Auntie’s Cottage" with flights from Athens and direct flights from abroad. The easiest way to come to Kefalonia is by direct flight to the airport of Kefalonia. If such a flight is not provided in your country, you can take a flight to Athens and then a connecting flight to Kefalonia. Alternatively, you can rent a car from Athens and drive to the ports of Patras or Kyllini. From those ports there are daily ferries to Kefalonia. We will be glad to assist you on organizing your travelling. The port of Sami is 14 km, a 15 minute drive from where you can take a ferry to Patras, on the mainland of Greece, Italy and the island of Ithaca. A car rental during your stay is recommended in order for you to explore the island. In Agia Efimia you can either hire a taxi to take you to Myrtos beach and the surrounding villages. Feel free to contact us for any questions. You will also find a tourist office in Agia Efimia for further information. 5 km (5 minute drive) to the beautiful harbour of Agia Efimia. 13 km to the quaint little fishing harbour of Assos with its Venetian Castle. *Due to possible roadworks, if you follow another route the distance is 24 km from "Auntie’s Cottage" to Assos but the view along the way will be worth the drive. Makriotika village and “Auntie’ s Cottage” are located on the slopes of the mountain Agia Dynati, thus you can enjoy a serene and quiet stay with privacy in a peaceful environment. Nature lovers and hikers will discover numerous walking trails and unspoilt mountain roads leading to the other local villages within the valley. A walking trail leads to the holy monastery of Themata (approx. 4 km from the cottage) in such a location offering breathtaking views. A path from the monastery leads further up to the top of Agia Dynati mountain and its Aeolic Park. You can choose one of the paths through the valley that leads you to Agia Efimia. In Agia Efimia, a 5 minute drive, you will find many more traditional taverns, shops, bars/cafes, bakery, supermarkets, a pharmacy, atm machine, car/motorbike rental places and enjoy a walk along Agia Efimia picturesque fishing port and waterfront. A diving school is located in the village offering guided dives. Makriotika and “Auntie’ s Cottage” are at the heart of Kefalonia island and is thus an ideal base for daily excursions to the villages, sightseeings and beaches of the island, like the famous Melissani Lake (just outside the village of Karavomilos) where a mini tour is done, the Drogarati Caves with stalactites and stalagmites still forming, the unspoiled, picturesque village of Assos with its Venetian Castle, the cosmopolitan harbour of Fiscardo from where you can take a boat to Lefkas, the stunning Myrtos beach, Antisamos beach and much more.